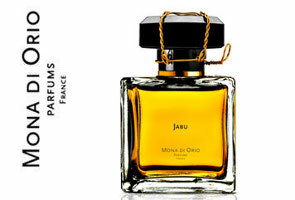 Mona di Orio has launched Jabu, a new fragrance for women. Jabu is short for Jubulani, the Zulu word for joy, and the fragrance has been created for Orange Babies, a charity working with HIV-infected mothers and children in Africa. A wind arriving with the coloured beat of Africa and laughter of the children of Orange Babies. A perfume like travel, a promis, soft like a caresse. That’s so great! I wish more lines would do stuff like this. The bottle’s pretty and the ‘fume sounds intriguing. Wonder when it’s coming stateside? I don’t think Mona di Orio has US distribution anymore…someone please correct me if I’m wrong! According to Marina at PST, they are looking for a US distributor – so I assume that means that they don’t have one. Her review made it sound wonderful and like something I would really like – but I can’t see ordering it unsniffed from overseas. I have not yet liked anything from the line (although I didn’t try Chamarre) so I can’t see ordering it either. I like these tie-ins to charity, but I’m immediately looking for info about how MUCH of the revenue is going to the charity — can’t find the info. It is the kind of thing that might sway me to buy a bottle at full retail — only if I sampled and liked the scent. Also, the 50ml is selling for 90€ and 100ml for 145€. HA — I cannot find it either. You do have to wonder. I guess we could send an e-mail and ask! This sounds really nice. If I liked the fragrance, the added bonus of contributing to a good cause with the purchase would be all the better. I wonder how one could snag a sample? Maybe check The Perfumed Court? Would think they’d get it eventually if they don’t have it already. The perfume sounds lovely to me and I am swayed by ad copy stating they donate funds… just sent an email to their press department and the offices in France. If I get a helpful reply will post with details. I received a reply today from Jeroen Oude Sogtoen. They sent a full PDF outline of their support for Orange Babies. Additional points on social awareness events and promotions for the cause. Overall it seems like a really earnest and helpful contribution. Plus, they updated their website ‘Friends and Sponsors’ page. Wonderful, thanks so much for following up! Oops, I should have read the whole thread. We’ll be interested! Just got to try Jabu today. Unlike most (all?) other Mona di Orio’s, this one doesn’t suffer from civet/animalics overload. I’d venture it’s the one with the most universal appeal from the line. The opening reminds me of Bal d’Afrique (going off memory): citrus & spice, and after that it’s a soft but dense, creamy orangeblossom-tuberose-general white flower thingie. I like it. Forgot to mention coconut (since that’s a love or hate affair) – there’s a subtle tropical coconutty-suntan vibe to it. Must be the monoï. Sounds pretty! The line has not impressed me so far. Lucky you, congrats on your new bottle!